Remember back in July when the South Shore Frolics Parade make its return? Milwaukee Makerspace was there! And now… there’s proof! Since I like attaching a GoPro camera to things, I stuck one on my car, which was in the parade, and shot a bunch of footage. So now you can relive the entire parade in just 60 seconds. Also, I left out the audio because I thought you would enjoy the silence. You can also see this video on Vimeo if you’re so inclined. The Milwaukee Makerspace, led by David Overbeck, took part in Milwaukee’s South Shore Frolics Parade on July 16th, 2011. in 2010 I joined David in watching the parade, and it was great… I mean, it’s commonly known as Milwaukee’s Best Parade, so it was with great pleasure I was able to join David this year in the parade. The Makerspace crew made it all happen. 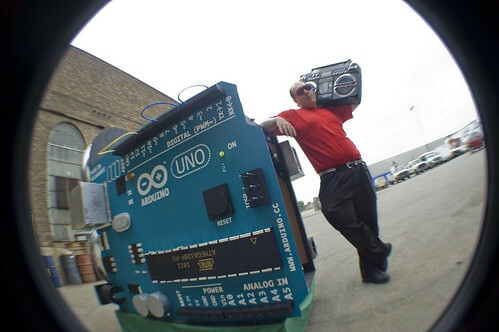 The Milwaukee Makerspace members joined together to do a “Group Build” where everyone pitches in to do something big… and by big, I’m taking about a 9 foot tall “Old Milwaukee Makerspace” beer can, and a giant double-Arduino (and jet) powered vehicle. We were also joined by Grave Digger and Little Pink Trike, which you might know from the Power Racing Series where they’ve done pretty well. We had a few “issues” getting everything working in time, and getting everything to hold together, but I’m proud to say we completed 99.8% of the parade route without issue, and I think we delighted the crowd. Here ye, here ye! Which I think means the same thing as “Yo!” I just wanted to remind you about the South Shore Frolics Parade happening on Saturday, July 16th, 2011, because this year, besides being (as always) totally awesome, it will be even more awesomer due to the fact that the Milwaukee Makerspace will be involved in it. But seriously folks, this is Milwaukee’s best parade. The Video Villain will tell you so himself. 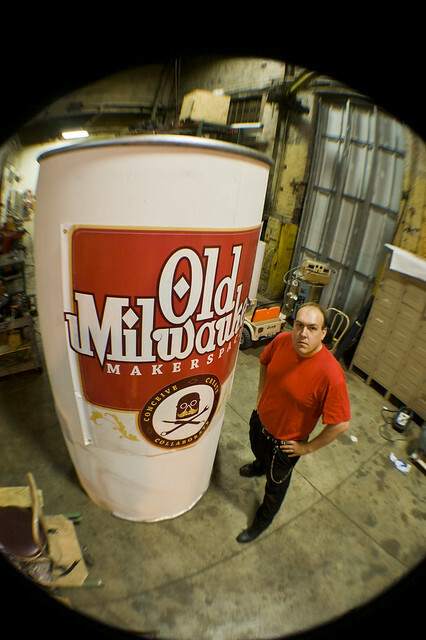 And as for what the Milwaukee Makers have in store for it? Well, let’s just say it’s top secret, but all will be revealed at the parade. We hope to see you there!